Sponsored by the Guild of Natural Science Illustrators and written by top illustrators, scientists, and industry experts, The Guild Handbook of Scientific Illustration, Second Edition is an indispensable reference guide for anyone who produces, assigns, or simply appreciates scientific illustration. 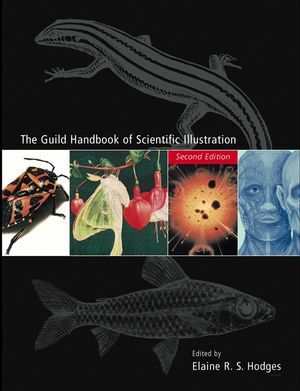 With step-by-step instructions, in-depth coverage of illustrative techniques and related tools, and helpful advice on the day-to-day business of scientific illustrating, it is easy to see why scientific illustrators refer to this book as their "bible." ELAINE R. S. HODGES worked as a scientific illustrator in the Department of Entomology at the Smithsonian Institutions National Museum of Natural History. After entering the field of scientific illustration at the Smithsonian in 1965, she helped found the Guild of Natural Science Illustrators, serving as its first newsletter editor and later as vice president and president. She has also lectured, taught, and written extensively in the field. Heavily illustrated with over 690 illustrations including 45 full-color illustrations. Covers hundreds of tools and materials with recommendation for surfaces, media, drawing tools, mounting matierals, measuring devices and more! Full coverage of rendering techniques for a wide array of subjects including: plants, fossils, extinct vertebrates, invertebrates, fishes, amphibians, and more. Covers business aspects of scientific illustration including copyright issues, contractual concerns, and advice on starting a freelance business.